As of father of six children, Will Cook has learned to deal with whatever life dishes out. On Saturday, December 8, Cook was handed the names of four children all in need of a Christmas. During the annual Ravens Roost #119 breakfast with Santa, four unexpected guests - two girls age 8, and two girls age 10 - turned out for the event. Because the rest of the 60 children attending the breakfast were receiving gifts, Cook was called upon to quickly save Christmas for the quartet. 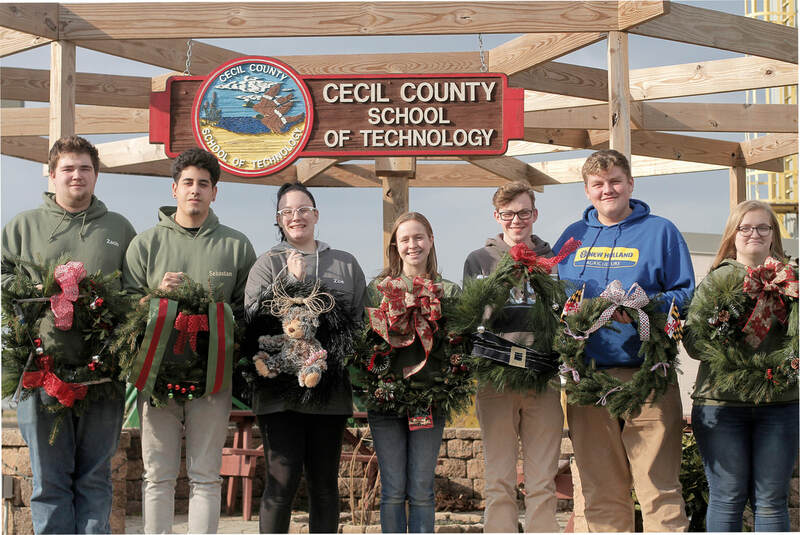 Students in Brittany Rigdon's Natural Resources class competed in a wreath design competition. After Thanksgiving break, students began collecting greens from around their home and the CCST grounds. They sold poinsettia grown in the school's greenhouse and made grave blankets and wreaths. "For the seniors, it factors into their overall grade, but we also thought we would turn it into a contest," Rigdon said. "A rubric shows how the wreaths have to be made. There is a theme but it doesn't have to be Christmas. One has a veterans theme and there is a wreath with a tools theme and a Ravens wreath." Zoe Mitchell of Rising Sun planned to make a donut theme wreath before reconsidering. "I originally had another idea, but that didn't work out," Mitchell said. "I had already spray-painted it so I just spray-painted it black. I brought in a stuffed animal and made it into something. It worked out better than I thought." Savannah Dunn of Elkton elected to go with a traditional Christmas theme. "It takes a lot of hard work," Dunn said. "You have to focus. I thought it would be a little easier." Courtney England of Rising Sun finished first. Dunn placed second. Cecil County School of Technology turned a project into a fun contest. Students in Brittany Rigdon's Natural Resources class competed in a wreath design competition. ​ That new Chester County Interconnect will come with something more than the $10 million price tag and higher rates for those on the town system. Chloramine and Fluoride will now be contained in the town water. Town administrator Calvin Bonenberger said last week that Chloramine is "not as dangerous" as the current Chlorine used to disinfect town water. He said that Chloramine has a longer shelf life than Chlorine. Port Deposit adopted a charter amendment resolution Tuesday, November 6, to reduce the number of members on its town council from six to four. Council members Robert Kuhs, Christopher Broomell, Kevin Brown, and Kate Rodgers all voted in favor of the amendment resolution. John Haines and Thomas Knight did not attend the meeting. The town must advertise the resolution for four weeks. Town administrator Vicky Rinkerman said the resolution also will be posted on Port Deposit's social media sites. The North East library is bringing the zoo to you. Animals will be featured in the upcoming program "Wildlife Adventures: Animals in Winter", which will be held Wednesday, November 28, at 4 p.m.
​ "The program focuses on how animals survive when the seasons change," branch manager Matt Lowder said. It is for children ages five -11 and their families. In 1975, Ken McCoy put a silver bracelet on his arm. Since that time, he has only removed it if medically required. McCoy is honoring the memory of Staff Sgt. Charles King, a prisoner of war who has been missing since Christmas Day 1968. McCoy doesn't know King, but he feels connected. McCoy, 69, of Elkton, served two tours of duty in Vietnam. "I signed up to go into the Navy when I was in high school. I volunteered," said McCoy. "My grandfather was in World War I. My dad was in World War II. My uncle was in Korea. I was in Vietnam." He was a gunner's mate in the military, spending his time in the service working on ammunition ships. He maintained the weapons on those ships. Four years ago, Chris Brown called his father and asked for his help building a deer stand. The actuality was that Chris Brown was building his version of a tribute to local history as a surprise for his dad, Bernie. Rising Sun's newest police officer Elijah Thompson had the chance to appreciate Brown's work - a wooden outhouse. No matter what the weather, there's a warming trend in Cecil County. The annual Coats for Kids campaign started November 1 at local public schools. This initiative started 35 years ago under the leadership of former school administrator and state delegate David Rudolph. Roger Owens has cleaned the coats since the drive started. First under Rudolph's direction, now Owens, who owns O' Kleen Cleaners and Laundromat and Village Laundromat in Elkton, does the work in partnership with the local Kiwanis. "I used to pick up the coats in my 1995 Ford Taurus. I would pile them so high that I couldn't see," said Owens, who now does coat pick ups and drop offs in his van. New and gently worn coats for children and adults are taken to schools and companies such as W.L. Gore and Terumo. They are then cleaned at Owens' businesses. Next, they are taken to the Cecil County Help Center on High Street in Elkton. Anyone can go there and get a coat free of charge. Children don't need to rely solely on schools to gain access to STEM learning materials. The Cecil County Public Library system last week began lending STEM Exploration Kits. ​ Designed for children in kindergarten through fifth grade, the themed kits come in a sealable plastic tub and contain books and hands-on materials which support different aspects of STEM, Rising Sun library branch man- ager Jennifer Carter said. Just over a year ago, the Town of Perryville's Green Team hit the ground running. "It's exciting. We're doing something good for the Town," said Perryville town administrator Denise Breder, who is part of the team. "We have 10-12 active people. It's great that we can engage people with something that they are passionate about - envi- ronmental issues. They (the team) has been consistent, thankfully."